My girlfriend and I go to different churches. I like mine better; she likes hers better. We'll figure it out eventually. But the thing I really like about her church, Elevation Church, is that it broadcasts services online. Elevation, of course, is one of the largest, fastest growing churches in the Charlotte area, and it has multiple campuses (including a new one it opened this month in Blakeney). And because the church has multiple locations, many of its attendees watch Pastor Steven Furtick and his worship services on screens via remote feed. So that's what Andrea and I did. 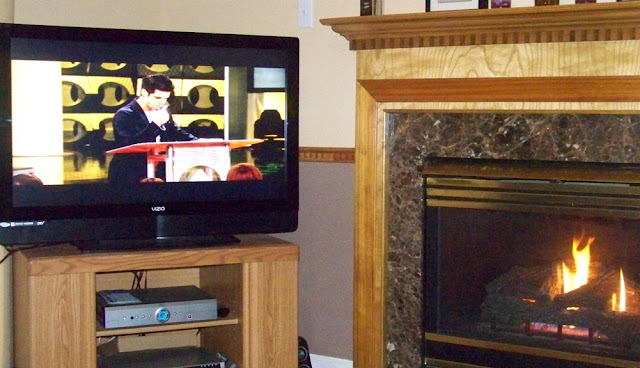 From the comforts of my living room, we engaged in The Elevation Experience and watched the 6 p.m. service online. I plugged my laptop into my TV. So as far as I'm concerned, I went to church yesterday! Though, I'd feel a little guilty (and lazy) if I did this every Sunday. And even though this wasn't First Sunday, which is when many churches offer Communion, let's just say there was some wine involved (don't judge me). It was a great sermon and I'm glad I got to experience it. You can watch (or listen to) many sermons by visiting Elevation's sermon archive. And it's worth noting that several other Charlotte churches stream their worship services online and have been for a few years now. This could be a great way for you to check out a church before actually visiting it.